The course consists of eight zip lines with over 6,000 feet of zip line fun between seven towers as high as 115 feet and reaching speeds of up to 30 mph! The course is laid out in a circle, lasting roughly 2 hours, beginning and ending in the same place, so participants ride all eight zip lines on the course. To see a map of the course, click here. Participants will experience a high-energy, fun-filled trip while learning about the course’s pristine coastal setting and gaining a sense of accomplishment, camaraderie and family bonding. Your two professional guides will greet your group with a brief overview of the experience and assist you in putting on zipping equipment. After your guides teach each person how to use your gear on the practice zip near ground level, they will lead your 10-person tour from beginning to end to ensure your safety and enjoyment. Our friendly and encouraging guides also act as Gulf Coast ambassadors, answering questions and educating you on the course’s pristine coastal setting. For your safety, guides are trained in First Aid, CPR and AED operation, as well as advanced rope skills and are in radio communications with the course supervisor and guest services at all times. 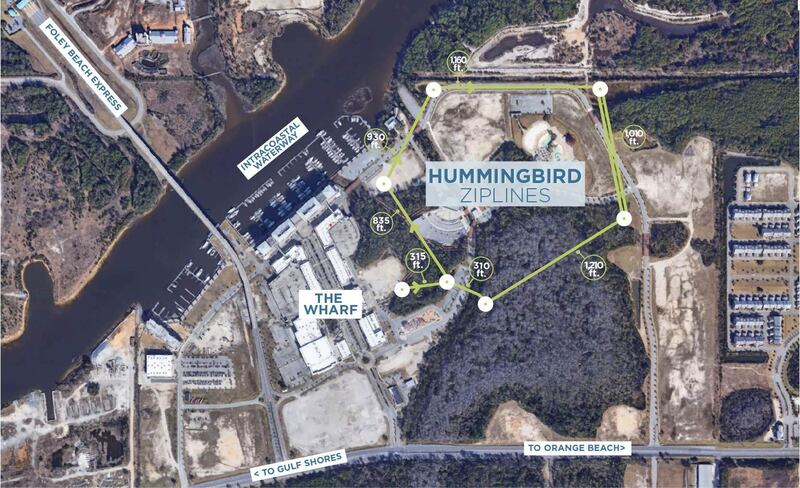 The Hummingbird Zipline Course is located at The Wharf in Orange Beach. Our street address is 4830 Main Street Suite G114, Orange Beach, AL 36561. The course is open year-round, seven days per week, but hours vary by season. View our schedule here! For directions to The Wharf, click here. For location within The Wharf property, click here. Participants must be at least 10 years of age and weigh between 70 and 250 pounds, able to climb several flights of stairs on each of seven towers and lift 15 pounds. Each participant (or guardian for those under 18) must sign a waiver for each person prior to participation. Tours are not recommended for those with a history of heart conditions, neck/back issues or other medical concerns. If you are unsure if a zip line tour is appropriate for you, please seek the advice of your physician prior to participation. Pregnant women are NOT allowed on the zip line. Tour times and days vary by season and spots fill up quickly during peak times, so reservations are highly recommended. Please make reservation as soon as possible to ensure you get the time slot that works best for you. We are happy to accommodate walk-up participants and will gladly get your party zipping on the next available trip. Click here for available trip times and exact pricing with tax and to book your trip online. No charges will be made until the Complete Booking button is clicked. While all adventure sports carry some risk, zip lining is among the safest, as participants are supervised and remain tethered while on the course. Our safety policies and procedures mirror the national standards set forth by the Association for Challenge Course Technology (ACCT). We use only the highest quality equipment and provide extensive personnel training. Guests should wear sturdy footwear such as sport sandals or tennis shoes. Closed-toe shoes are required for all guests and flip flops will NOT be allowed on the zip line course. While the course enjoys consistent breezes from the Gulf of Mexico, summer temperatures can reach into the 90s, so we suggest wearing lightweight, breathable and comfortable clothing. When selecting your clothing, remember that you will be wearing a harness while on the course. You will be wearing a harness, gloves and a helmet during your zip line tour, so having loose objects in your pockets will be uncomfortable and presents a risk of loss or injury. Please remove hanging/dangling jewelry or rings, loose objects such as wallets, cell phones, keys, knives, and loose change from your pockets or body and secure them either in your vehicle or in the provided keyed lockers. If you intend to wear sunglasses or prescription glasses, please ensure that they are on a strap to keep them secure around your neck. Hummingbird Zipline Course assumes NO responsibility for lost or broken items. While cameras are allowed, we have professional photographers taking great photos of individuals and groups for you from vantage points only they can reach, so we recommend that you leave cameras and cell phones behind. Bear in mind that while wearing a harness and gloves, pants pockets are largely inaccessible. Cameras and cell phones MUST be pocket-sized and securely contained on your person while on the zip line. Guides can advise you on the acceptability of specific items. Photography is only allowed while on the towers and at the discretion of your guides. We are not responsible for lost cameras or other items while on the zip line course. Your party must arrive at least 20 minutes before your scheduled trip time to prepare your group to zip. Should you arrive late, regardless of the reason, you cannot join a trip in progress. We will make every effort to reschedule your trip based on availability, but NO refunds will be issued for late arrivals. Hummingbird Zipline Course has a very accommodating, but fixed cancellation/refund policy. We will fully refund or reschedule your trip if you cancel at least 24 hours in advance of your trip time. If you cancel less than 24 hours in advance or do not complete the trip, you will receive a rain check in lieu of a refund. The rain check does not expire and is transferable. NO refunds will be issued for no-shows, however, we will issue a rain check which does not expire and is transferable. Contact Guest Services for details. Smoking is not permitted anywhere on the course, nor are alcoholic beverages. For the safety of all participants, those deemed by our staff to be under the influence of alcohol or other mood-altering substances will be barred from participating at our sole discretion. Hummingbird Zipline Course is in NO way obligated to complete a tour for a participant who is endangering the safety of themselves, others or the environment. Refunds or rain checks will NOT be issued under these circumstances. Hummingbird Zipline Course provides a high-energy, fun, family-oriented educational and achievement-based experience for our guests and your positive experience is our mission and our goal. As such, we reserve the right to refuse access to the course or remove any participant whose conduct is, in our sole judgment, contrary to the spirit, nature, and mission of our venue. Fill out the contact form below if you have any more questions or concerns and we will get back to you shortly!